Playing one of the toughest schedules in Class AA and by far the most strenuous out of the North Georgia mountains instead of hiding and padding their record like so many other schools have in the past, No. 8 Chattooga (5-4) has made a concerted effort to test themselves, not for Region 7 play but for the big picture – the state tournament. 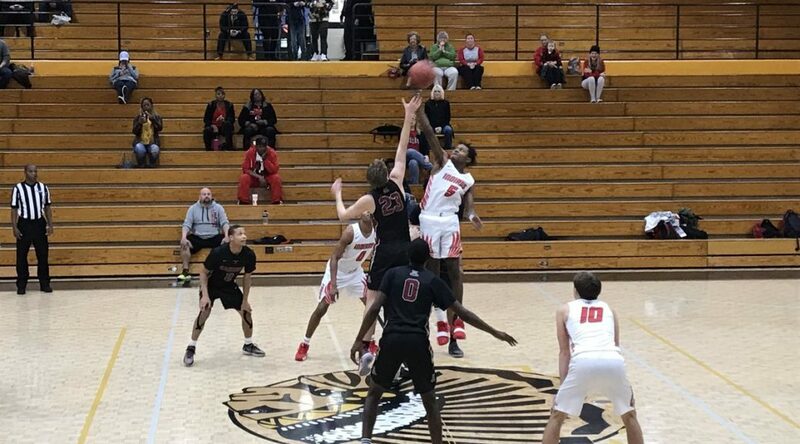 The undersized Indians were back on the road Thursday afternoon making the 69-mile drive to the War Lodge Invitational at Sequoyah where they battled Alpharetta (8-4), a Class AAAAAA school starting to find its groove. With 5-foot-6 Jundraius “Nuk” Adams benched to start the game, Alpharetta took advantage of the smaller offense-less Indians by jumping out to an 8-2 lead behind a Kalik Brooks And-1 and threes from North Carolina A&T-signee Brandon Barron and Machi Sibblies. 6-foot-5 junior Josh Spencer made his season debut after an ankle sprain and broken finger sidelined him for the first 11 games and quickly made an impact inside with his rebounding and defense. At the end of one, Alpharetta led 14-4, but much like at the SportalShowcase against No. 1 Woodville-Tompkins, once Adams entered the game and hit his first shot, the wheels began to turn for the Indians. Back-to-back Adams hoops cut the score to 17-9 at the 6:46 mark before Jamarious Mosteller banked in a jumper to make it 22-14. As the Indians inched closer and closer, the backcourt of Barron and Brooks held them at arm’s reach. Saddled with foul trouble in the first quarter, Brooks went 4-of-4 from the line while Barron nailed his second three and added a layup to combine for nine of the Raiders’ 14 second quarter points. With 1:15 remaining in the half, Jayden Stephens cleaned up a Barron miss and made the score 26-17. Alpharetta entered the half up 28-20 but Coach Jared Groce made adjustments to find more open looks for Chattooga as the Indians sparked a 5-0 run with Mosteller finishing inside to trim the lead to 28-25 at the 6:05 mark. Adams scored to make it 33-27 with 1:57 remaining but the Raiders stole momentum heading into the fourth quarter closing on a 7-2 run ignited by a Barron assist to Kyle Hulsman in the corner for three and capped by a Barron layup before Clayton Johnson hit a late layup to send the game into the final frame with the Indians trailing 40-29. The Raiders led 42-31 at the 6:38 mark following a Barron fast break dunk, bouncing the ball to himself and throwing it down with Johnson on his hip. Johnson answered back with a hoop of his own, but Spencer wore down the smaller Indians on the offensive glass, garnering another rebound and put-back to edge the lead out to 44-36 with 4:40 to play. Thirty-seven seconds later, not knowing he had four fouls, Johnson fouled out at half court leaving the Indians without one of their top scorers down the stretch, Johnson finishing his night with 12 points. Trying to claw their way to a one possession game, Chattooga got burnt twice in a 36-second span by Hulsman who drilled back-to-back threes to give the Raiders a comfortable 52-42 lead with 2:23 remaining. Tre Flowers gave Chattooga one last breath when he knocked down his second three of the night to bring the deficit to 52-45 with 1:47 to play, but Stephens scooped up a loose ball and laid it up to push the lead back out to nine to officially put the game out of reach. Alpharetta has their best basketball coming over the next few months now that they are healthy. Josh Spencer was a major lift inside and once he gets his conditioning and feel back, he will be an important piece that can battle in the paint for Coach Eric Blair. Brandon Barron was steady throughout and played a great floor-game finishing with a game-high 15 points, 8 rebounds, 4 assists and 3 steals, leading the Raiders in all categories. His quickness and athleticism helped him slice into the lane at will and his two three-pointers helped stretch the defense. Speaking of stretching the defense, Kyle Hulsman looked like Robert Horry, nailing crushing threes in the second half. His nine points were the difference late in the game. Kalik Brooks sat for a majority of the first half with foul trouble but he was productive when on the floor and earned rave reviews from the Indians after the game. His length gave them fits on defense but it was his slithery ability to maneuver into the lane for layups which got him going. Chattooga’s inability to score in the first quarter came back to haunt them. Nuk Adams is so important for their offensive flow, he is their engine. Without Adams buckets are hard to come by, but once he sees his first shot drop, it energizes the entire team. Having a streaky 5-foot-6 point guard as their best shot creator can be tough at times, but the Indians playing against teams with great length will prepare them for the state tournament where they won’t have to worry about too many lineups that can start four players over 6-foot-4. Clayton Johnson played a very nice game offensively with 12 points and hit two timely threes. Having his three-point shot calibrated helps the Indians space the floor and allow Adams to create shots for others. Lefty Tre Flowers stepped up with eight points and nailed two threes while Jamarious Mosteller impacted the game on both sides of the ball. The Indians needed more production from their forwards Malachi Mack and Devin Price who combined for three points. Mack rebounded the ball well in the first half and finished with three blocks, but Price could never find a niche to impact the game like he usually does. The Indians have proven they can compete with bigger and better teams and that they aren’t just another prototypical North Georgia team that feasts on cupcakes. They are a serious threat come February. Chattooga’s lack of true full-time basketball players may hurt them down the stretch, but their competitiveness and athleticism will keep them in every game, especially in Class 2A.